18 left in stock, Hurry! Purple symbolizes royalty. Let out your inner goddess with this delicate ring. 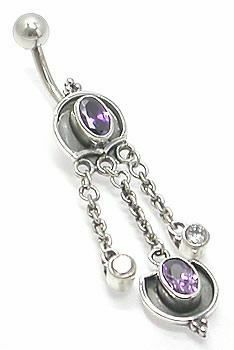 This handmade piece has 2 oval purple jewels, both popping out of an onyx platform and topped with silver granulations. The 2 outer dangles float with crystal jewels beneath. Made with only the finest quality materials for you, your majesty. If you want to feel even more royal, check out for these Armor Purple Bali Earrings to match your royal purple belly ring.